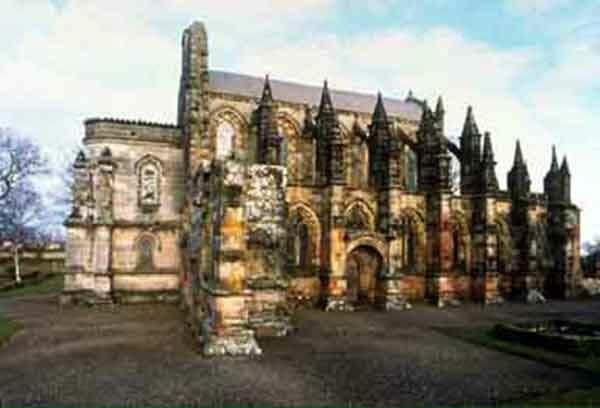 Rosslyn Chapel, or the Collegiate Chapel of St Mathew as it was to have been, was founded in 1446 by Sir William St Clair, third and last St Clair Prince of Orkney. It is in fact only part of the choir of what was intended to be a larger cruciform building with a tower at its centre. The principal authority on the history of the Chapel and the St Clair family is Father Richard Augustine Hay, Canon of St Genevieve in Paris and Prior of St Piermont. He examined historical records and charters of the St Clairs and completed a three volume study in 1700, parts of which were published in 1835 as A geneologie of the Sainteclaires of Rosslyn. His research was timely, since the original documents subsequently disappeared. Prince William, his age creeping on him, came to consider how he had spent his times past, and how he was to spend his remaining days. Therefore, to the end, that he might not seem altogether unthankful to God for the benefices he received from Him, it came into his mind to build a house for God's service, of most curious work, the which that it might be done with greater glory and splendor he caused artificers to be brought from other regions and foreign kingdoms and caused daily to be abundance of all kinds of workmen present as masons, carpenters, smiths, barrowmen and quarriers... the foundation of this work he caused to be lain in the year of our Lord 1446, and to the end, the work might be more rare, first he caused draughts (plans) to be drawn upon eastland boards [imported Baltic timber], and he made the carpenters carve them according to the draughts thereon and he gave them to for patterns to the masons, that they might cut the like in stone and because he thought the masons had not a convenient place to lodge in...he made them build the town of Rolsine that is now extant and gave everyone a house and lands. He rewarded the masons according to their degree, as to the Master Mason, he gave nearly 40 pounds yearly, and to everyone of the rest, 10 pounds. Sir William's son and successor to the Barony of Rosslyn, Sir Oliver St Clair, roofed the choir with its stone vault but did no more to fulfil his father's original design. The Chapel was generously endowed by the founder, with provision for a provost, six prebendaries and two choristers, and in 1523 by his grandson, also Sir William, with land for dwelling houses and gardens. On February 26,1571, however, just forty-eight years after his last endowment, there is a record of the provost and prebendaries resigning because of the endowments being taken by 'force and violence' into secular hands as the effects of the Reformation took hold. 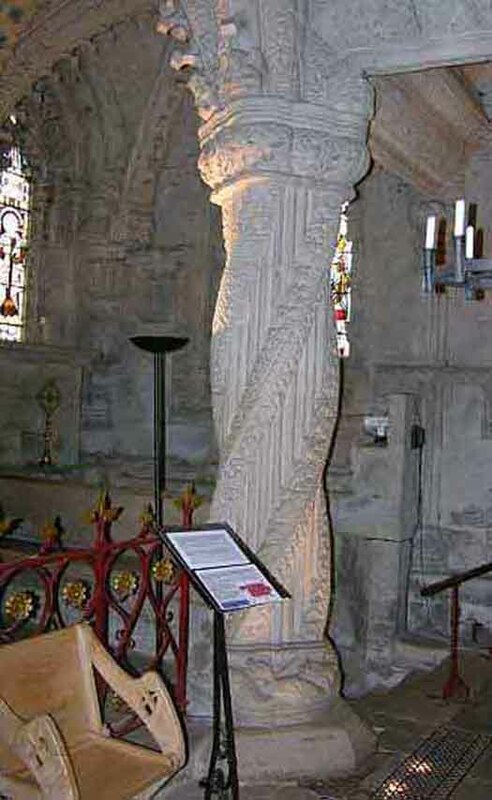 The Presbytery records of Dalkeith reveal that in 1589 William Knox, brother of John Knox and minister of Cockpen, was censured 'for baptizing the Laird of Rosling's bairne' in Rosslyn Chapel, which was described as a 'house and monument of idolatrie, and not ane place appointit for teiching the word and ministratioun of ye sacrementis'. The following year, the Presbytery forbade Mr George Ramsay, minister of Lasswade, from burying the wife of a later Oliver St Clair in the Chapel. The St Clairs had not yet succumbed to the Reformation and remained Roman Catholics. This Oliver St Clair was repeatedly warned to destroy the altars in the Chapel and in1592 was summoned to appear before the General Assembly and threatened with excommunication if the altars remained standing after August 17th, 1592. On August 31st, the same George Ramsay reported that 'the altars of Roslene were haille demolishit'. From that time the Chapel ceased to be used as a house of prayer and soon fell into disrepair. In 1650, during the Civil War, Cromwell's troops under General Monk attacked the castle and his horses were stabled in the Chapel. On December 11th, 1688, shortly after the protestant William of Orange had landed in England and displaced the Catholic James II, a mob from Edinburgh and some of the villagers from Roslin entered and damaged the Chapel. Their object was to destroy the furniture and vestments, which were now regarded as Popish and idolatrous. The Chapel remained abandoned until 1736, when St James St Clair glazed the windows for the first time, repaired the roof, and relaid the floor with flagstones. The boundary wall was also built at this time. Further repairs to the Chapel were undertaken at the beginning of the nineteenth century and in 1861 it was agreed by James Alexander, 3rd Earl of Rosslyn, that Sunday services should begin again. He instructed the Edinburgh architect David Bryce to carry out restoration work. The carvings in the Lady Chapel were attended to, stones were relaid in the crypt and an altar established there. The Chapel was rededicated on Tuesday April 22nd, 1862, by the Bishop of Edinburgh and the Bishop of Brechin preached from the text, 'Our Lord, I have loved the habitation of thy house, and the place where thine honour dwelleth'. The Reverend R. Cole, then resident military chaplain at Greenlaw Barracks near Penicuick, became private chaplain to the Earl. Lady Helen Wedderburn, daughter of the 7th Earl of Airlie, who lived nearby at Rosebank, organised a subscription from which some of the interior fittings were provided. In 1880-1, Francis Robert, 4th Earl of Rosslyn, added the apse to serve as a baptistry with an organ loft above. The work is by Andrew Kerr. The Earl also filled the baptistry arch with the handsome oak tracery which you see today, decorated with his crest. Together with the two Chapel doors, this is the only wood used in the construction of the building. In 1915, a report on the fabric by Sir Robert Lorimer observed: ' The stone work of the Chapel is in fairly good order and requires very little done to it... a few of the stones are crumbling but not to the extent to cause any alarm. The condition of the roof is not satisfactory... and there are a number of gaps and cracks all over.' He recommended that the exterior of the roof be covered with asphalt and this was carried out. A copy of the letter was sent to Gwilym Lloyd George MP, the Minister of Fuel, who in turn wrote to the Secretary of State for Scotland in the following terms; 'I enclose a copy of a letter from David Robertson which causes me considerable embarrassment, who am I, a Welshman, that I should do anything that might imperil the eternal salvation of one Scottish Episcopalian. In any case, from the fuel point of view, I doubt whether I would be justified in securing a small economy of fuel in this world at the possible cost of a disproportionate expenditure of it on myself in the next.' The Chapel remained open. This work was in accordance with the thinking of the time but not, unfortunately, with current conservation philosophy. The effect of the magnesium fluoride - a cementitious slurry - was to seal the internal surface of the masonry with an impermeable coating, so that the stone became saturated with water containing soluble pollutants. In addition, the coldness of the wet stone encouraged condensation. A report in 1995 confirmed that damage was occurring and that humidity in the Chapel was very high. It recommended that steps should be taken to dry out the saturated masonry, remove if possible the cementitious coating, and restore the permeability of the richly carved inner surfaces of the Chapel. In March 1997, a free-standing steel structure was erected to cover the Chapel. 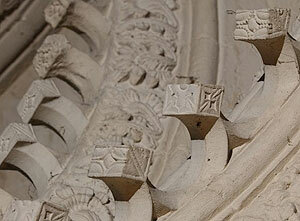 It will enable the stone fabric of the roof vaults to dry outwards, away from the carved interior surfaces. In due course the bituminous felt, asphalt and concrete coverings of the stone roof vaults will be removed to assist this process. Stone and mortar repairs to the external walls, pinnacles, and buttresses, renewal of the rainwater disposal arrangements, repairs to the stained glass, and appropriate repair and conservation of the interior are all required. The coverings over the stone vaulted roofs will be renewed in lead and ways of removing the cementitious slurry are being investigated, in order that this magnificent building can be preserved for future generations to use and admire. The year 2000 saw the Trust embark on a second phase of work. Funded jointly by The National Heritage Lottery Fund, The Eastern Scotland European Partnership, Historic Scotland and the Rosslyn Chapel Trust, this phase has a number of elements. Essential stabilization works to the east boundary walls will protect the Chapel. A new roof of Caithness slate has been placed over the existing Crypt roof, and the Priest's Cell and two more modern buildings beside the Crypt have been made functional. The stairs to the Crypt have been repaired and the access to the Crypt is now both safer and more of an experience. Work has also been carried out to improve the electrical services in the Chapel, repairs to the wooden screen at the west end, and our interpretation of Rosslyn's story. Rosslyn Chapel, originally named the Collegiate Chapel of St. Matthew, is a 15th Century church in the village of Roslin, Midlothian, Scotland. The chapel was designed by William Sinclair of the St. Clair family, a Scottish noble family descended from Norman knights and, according to legend, linked to the Knights Templar. Construction of the chapel began in 1440, and the chapel was officially founded in 1446. Construction lasted for forty years. Some authors have theorized that the Chapel's west wall is actually a model of the Wailing Wall in Jerusalem and is part of the structure by design, rather than proof of another intended stage of building, which would have made the site about the size of a Cathedral. The chapel has long been famous for its possible connections to Freemasonry and its attendant rituals. This was first publicized by Knight and Lomas, but it is also found in works by Michael Baigent and Leigh and Tim Wallace Murphy (circa 1990), and the connections entered mainstream consciousness when named in the novel The Da Vinci Code for its (possible) links to the Holy Grail. Despite the fictitious nature of this work, its influence has been considerable. 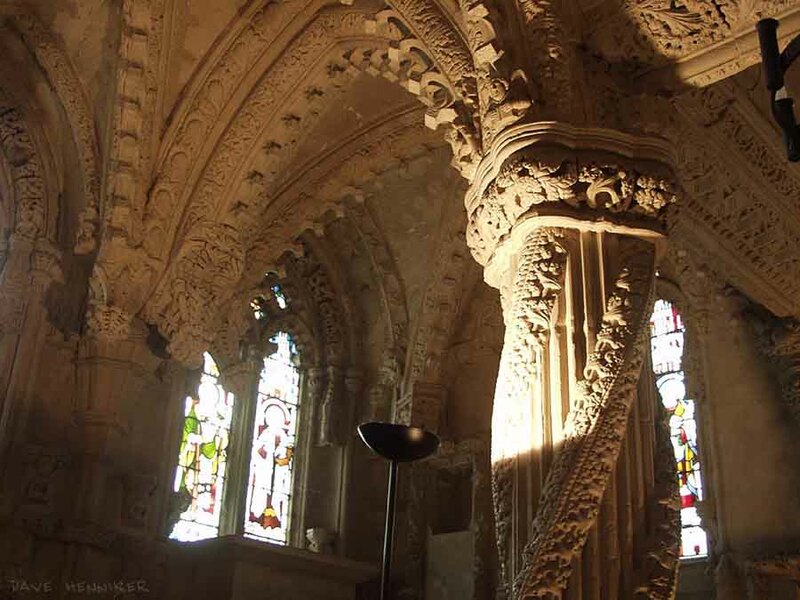 The Scottish NGO The Friends of Rosslyn, which own the land surrounding the Chapel and the Rosslyn Chapel Trust which administers the Chapel, have both published a number of books and literature on the Chapel. Certainly the Chapel is used by the modern Knights Templar (a masonic group rather than descendants of the military religious order) for 'investiture' ceremonies, and because of its connection to one of the more famous freemasons (William Sinclair) and also due to the Masonic architecture and symbolism featured on the Chapel walls, many Freemasons from all over the world visit it. Certain points in its architecture are quite indicative of a Masonic, and Templar, connection. 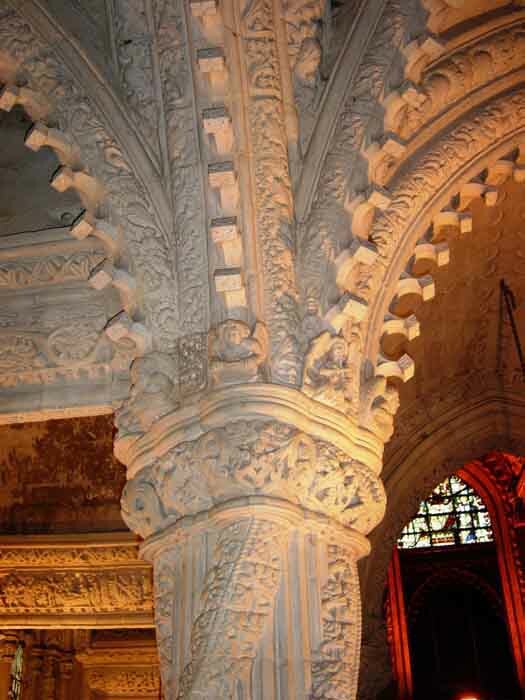 3. most importantly, Rosslyn Chapel, although completed six years before Columbus' voyage, allegedly has stone carvings in it of plants unique to the Western hemisphere. Because of its rumored connections with Freemasonry, the chapel has inevitably become listed as one of the possible final resting places of The Holy Grail. This is a possibility based on legends of 'Secret Vaults' and the possibility that the similarities between Rosslyn and the Temple of Jerusalem might be more than cosmetic. The White Lady of Rosslyn Castle is said to hide a secret worth 'millions of pounds' - and some have suggested that this could be The Grail or instructions on how to find it. St Clair legend suggests that there are three big medieval chests (probably the size of steamer trunks) buried somewhere on the property, and this has inevitably led to various theories as to the chests' contents. Past scanning and excavations in or near the Chapel have not yielded any such chests. Sealed chambers under the basement of the chapel, however, have yet to be excavated for fear of collapse of the entire structure. These chambers are filled with pure white Arabic sand -- rumored to have been brought to the chapel by the Knights Templar from the Dome of the Rock -- and ultrasonic scans have revealed six leaden vaults within the sand. It should be noted that it is only the Ruined Wall that is based on the Temple of Jerusalem - the chapel itself most closely resembles the East Quire of Glasgow Cathedral. 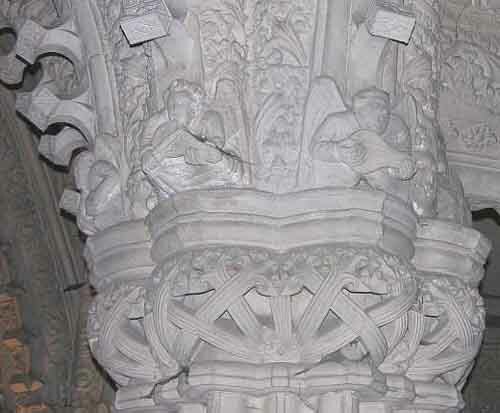 The Chapel is famous for its two pillars: the Apprentice Pillar and the Master Pillar which, though next to each other, are carved differently. 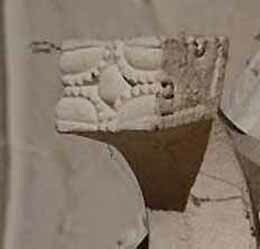 Masonic Architects believe these structures could signify the pillars of Boaz and Jachin. Most interestingly are the (pictorial) references to the Key of Hiram, a significant piece of Masonic legend in the wall carvings, and in depictions of the New World, purportedly showing maize and aloe vera plants about a century before the discovery of North America, suggesting pre-Columbus travel there (the La Merika theory). Also many archaeoastronomers believe that the walls are carved with azimuths, that give co-ordinates for sites in Iceland (where the St. Clairs supposedly originated) and across Britain. M.Oxbrow & I. Robertson. Rosslyn and the Grail Mainstream Publishing, 2005. 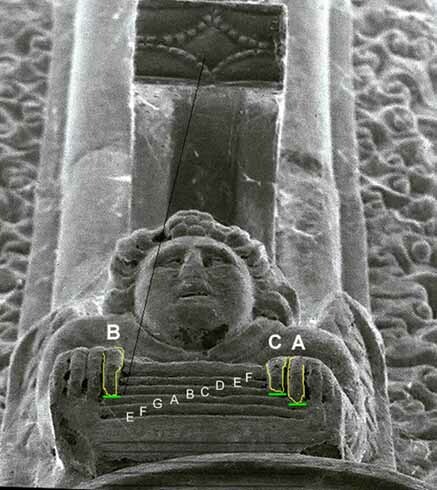 In September 2007 a musical cipher hidden in mystical symbols carved into the stone ceiling of Rosslyn Chapel was reported as being unravelled by Scottish composer Stuart Mitchell. His feat was hailed by experts as a stroke of genius. The codes were hidden in 213 cubes in the ceiling of the chapel, where parts of the film of Dan Brown's best-seller The Da Vinci Code were shot. Each cube contained different patterns to form an unusual 6 minute piece of music for 13 medieval players. The unusual sound is thought to have been of great spiritual significance to those who built the chapel. The melody was unravelled after Mr Mitchell discovered the stones at the bottom of each of 12 pillars inside the chapel formed a cadence (three chords at the end of a piece of music) of which there were only three types in the 15th century. Mr. Mitchell said the music sounded like a nursery rhyme. "Everyone wants to hear something miraculous but William Sinclair, who designed the chapel, was an architect, not a musician," he said. "It is evident from the nursery rhyme style of the music that he could not play very well. It is in triple time, sounds childlike and is based on plain chant which was the common form of rhythm of the time." The strange combination of instruments in the piece includes bagpipes, whistles, trumpet, a medieval mouth piano, guitar and singers. Rosslyn Chapel was built by Sir William Sinclair and Sir Gilbert Haye in the 15th century. Steeped in the history of the Knights Templar and Freemasonry, Roslyn's mysteries are famous worldwide. Among the theories surrounding Rosslyn is that it is the secret resting place of the Holy Grail, the Ark of the Covenant and even the mummified head of Christ. 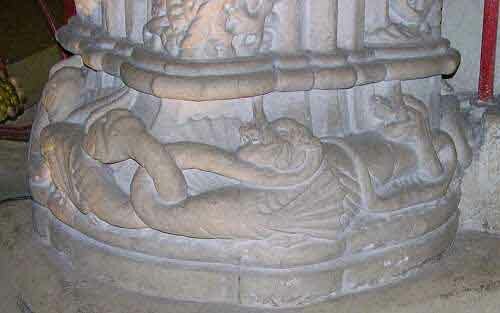 Rosslyn Chapel holds many secrets. For hundreds of years experts and visitors alike have puzzled over the carvings in the chapel. Whilst some debate whether they point to hidden treasure, Edinburgh composer Stuart Mitchell thinks he has cracked one part of the enigma. He believes that the ornate ceiling of carved arches, featuring 213 decorated cubes holds a code for medieval music. His father Thomas Mitchell spent 20 years cracking this code in the ceiling and now Stuart is orchestrating the findings for a new recording called The Rosslyn Motet. They hope that the music, when played on medieval instruments in situ, will resonate throughout the chapel unlocking a secret in the stone. The breakthrough to interpreting the notation came when Mitchell's father discovered that the markings carved on the face of the cubes seem to match a phenomenon called Cymatics or Chladni patterns. Chladni patterns form when a sustained note is used to vibrate a sheet of metal covered in powder producing marks. The frequency used dictates the shape of the pattern, for example; the musical note A below middle C vibrates at 440 KHz and produces a shape that looks like a rhombus. Different notes can produce various shapes including flowers, diamonds and hexagons - shapes all present on the Rosslyn cubes. Stuart Mitchell believes this is "beyond coincidence" and has assigned a note to each cube. Ernst Chladni first documented the phenomenon in the late 18th century - yet it appears to be present in a 15th century building. Which begs the question: "Was Sir William St Clair (the man who built Rosslyn Chapel) familiar with sciences far in advance of his time?". Stuart Mitchell believes a link between the Knights Templar ­ who may have gleaned advanced Eastern scientific knowledge during their stay in Jerusalem during the Crusades ­ and Rosslyn could explain the encoded musical notes. "The symbolism in Rosslyn is reaching back to times of a civilization that is lost to us now that had sciences that are the roots of all the mechanics of the universe," says Mitchell. 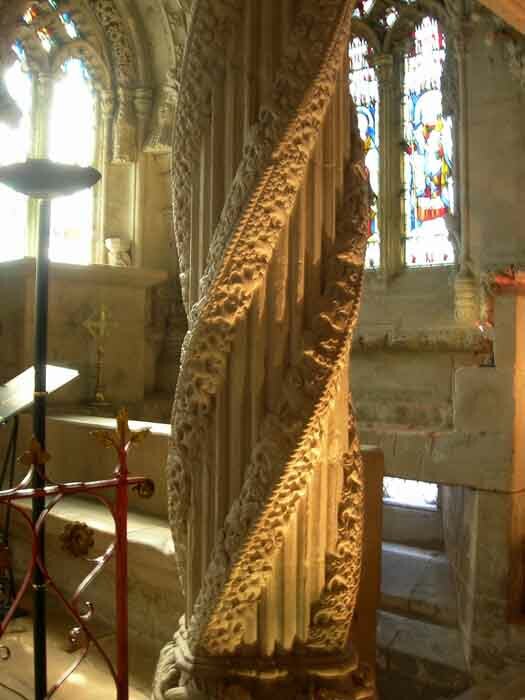 If this science was used in the carvings at Rosslyn, then there needs to be an explanation of how this information came to be lost for centuries. According to Mitchell, the Church suppressed the knowledge as a means of controlling the public. "What it points towards is the church system denying people certain knowledge because knowledge is awareness. People who knew too much were burnt as witches." a way of showing a musical note by way of its vibrations. Interestingly the Devil's Chord - diabolus in musica - makes an appearance in the music." In the ceiling is this jump of an augmented fourth, in fact it opens up with an augmented fourth," says Mitchell. The Catholic Church had banned this interval (seven semitones) from medieval music as it was believed to be disturbing and therefore diabolical. Perhaps St Clair was indeed challenging the authority of the church. The music itself, according to Mitchell is a mix "of Celtic melodies and secular worship crossed with a kind of Christian worship" but not Catholic he says. Perhaps this explains why carvings depicting the green man, essentially a pagan image, exist alongside carvings of Christ in the chapel. "[Orkney] and the Shetlands had a very big druid, pagan community and they had their own culture of music," says Mitchell. "William St Clair was the last Earl of Orkney and some of the melodies in the ceiling of Rosslyn Chapel are Orkney/Shetland Airs." 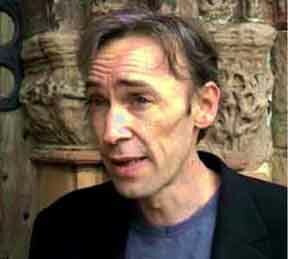 Mitchell doesn't believe that the notes were carved there simply to record a piece of music. 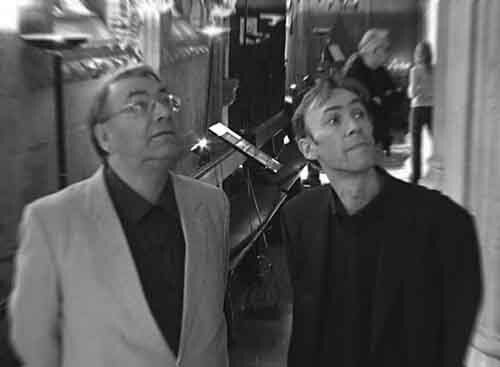 He hopes that the repeated frequencies in the music will resonate within the building and unlock a medieval secret." Hopefully, knowing masons of this period of time were aware of the acoustic properties and the effect of resonance upon stone, we're hoping something falls looseŠ it's like a safe. This is why we think he [St Clair] has gone to so much trouble." Mitchell has no idea what may be hidden in the church, but believes that St Clair used advanced science to ensure that the music was hidden from prying eyes. Mitchell, dubbing the project "The Voice of Creation", says the carvings on the cubes are ultimately about sacred geometry. "What it's saying is we've forgotten more than we know. Perhaps the music is indeed a key to the past, the physics of the universe and just maybe, played loud enough inside Rosslyn, it will unlock a long lost secret hidden in the masonry.